Recreating A Dramatic Look | beauty. bikes. 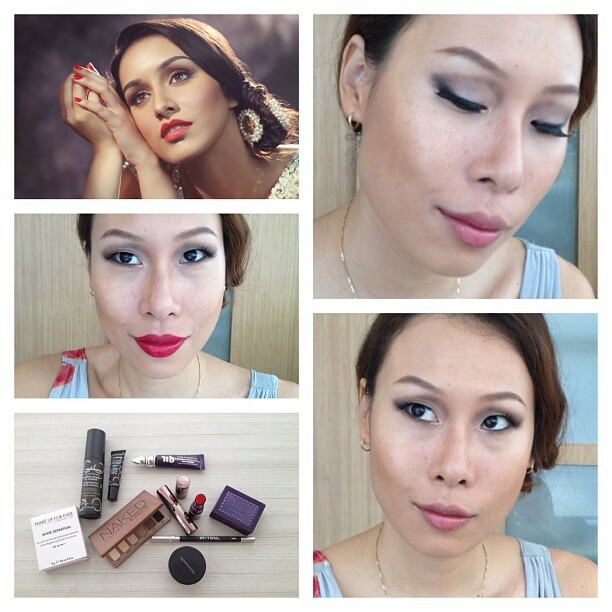 A client of mine asked me to recommend some products to recreate this look (top left) for Hari Raya. She liked everything except the red lips, so I did two options, one with red and the other with a natural colour. Sorry I’ve been so busy that this comes sooo last minute! Let me know if any of you are interested to see a step-by-step for this look, and I could upload some pictures next. In the meantime, here’s the low-down on how to get this look!! Eyes: From Urban Decay Cosmetics, I used the Anti aging eyeshadow primer, followed by the Naked Basics Eyeshadow Palette. Lined the eyes with 24/7 Eyeliner in Smoke. Phew!!! I don’t have the deep crease that the model in the pic has but I tried my best to create something similar! Tags: contoured, dramatic, makeup, tutorial. Bookmark the permalink.